A very stylish and contemporary way to shade your home, office or work place. A functional and practical alternative to traditional blinds and other shading options, our stretched shade sails and shade sail blinds offer both style and substance. Dramatically cut glare and transform any space without reducing natural light. Able to transform any area , our shade sails can be used inside to provide a contemporary shading and privacy solution to provide protection against the weather. 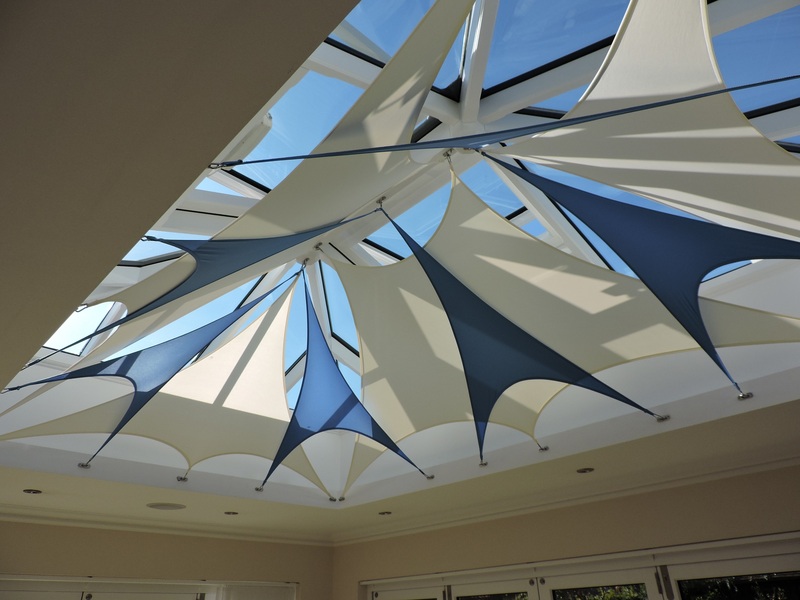 We will design a bespoke layout and installation plan for you, so you don’t have to worry about how your shade sail blinds or shade sail solutions will work in your space. First in Europe to develop Revolutionary water resistant stretch fabric technology. Shade sail blinds by Airsculpt are the first company in Europe to develop and bring to market a permanent water repellent ‘multi directional stretch’ fabric’ Elastospan’. With indoor shade sails that filter harmful UV rays you can mix and match colours and shapes to enhance your existing décor – or you can opt for our garden sails that are constructed from high-strength water repelling fabric to provide robust protection from the elements, and with a style that’s superior to any garden canopy or patio umbrella. As a division of Airsculpt, Shade Sail Blinds has an engineering pedigree and a commitment to quality that quickly reveals itself when you unpack your indoor and outdoor sails. Each one has been created using 95% recycled plastic bottles to become one of the most environmentally responsible materials available today. Benefitting from a uniform stretchiness, your sun shade sails won’t sag or droop, plus they can be easily cleaned in a domestic washing machine to keep them looking as good as new for many years to come. 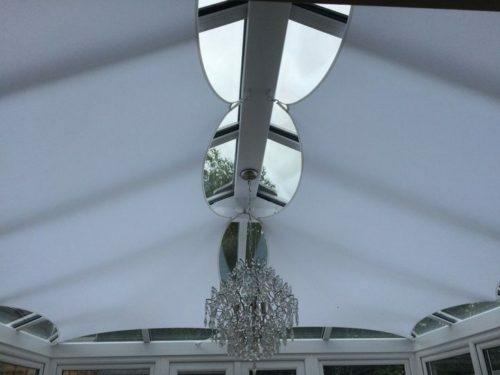 Our sails are simple to fit with a ‘No Drill’ mounting system – perfect for ensuring your conservatory warranty is preserved – or you can opt for stylish chrome fittings if you prefer. If you’d like us to install your sail canopy – we’ll be happy to discuss our fitting service with you, ensuring your indoor or garden sails are exactly as you want them. As homes and businesses look to create more organic and relaxing environments, sun shade sails are becoming one of the most eagerly adopted ways of filtering harsh light and introducing a new aesthetic to conservatories, atriums, outdoor cafes, retail outlets and offices. Browse our Gallery to see just a few examples of our sun shade sails & Conservatory Sail Blindsin homes and businesses across Britain – then call us to share your ideas with us, we’ll be happy to hear from you. We absolutely love our sail blinds – they look amazing in our conservatory and fit with our contemporary decor throughout our home. Frankly, they make all of our friends’ traditional blinds appear rather dreary!